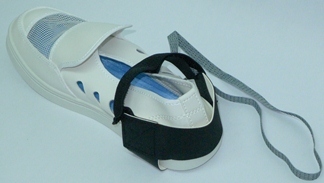 The ESD heel grounder provides effective grounding for mobile personnel in ESD sensitive areas. For remote areas where wrist straps are not applicable, the ESD heel strap ensures maximum protection of your products from electrostatic charges. It provides direct dissipation path of static charges generated. Material: Conductive compound attached with conductive ribbon for effective grounding 1 Meg Ω resistor attached. Application: Semiconductor, Electronics Assembly, Aviation Industries, Field Engineers.